Lancer Skincare's The Method: Travel Bag is a three step skincare routine with additional eye and body treats to achieve beautifully restored, youthful looking skin. 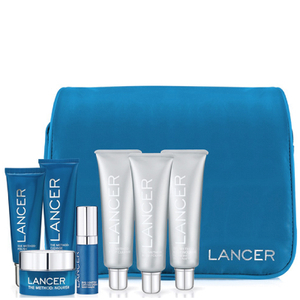 Combining a range of highly coveted, travel-sized products, the set is your answer to perfect skin, wherever you are. Housed in a handy travel bag. A gentle treatment formulated to visibly improve skin tone and texture. Pure minerals are combined with magnesium oxide and sodium bicarbonate crystals to exfoliate the skin's surface, combating dullness, removing the build-up of debris for a refreshed, youthful-looking complexion. Fortified with pumpkin and pomegranate extracts, the anti-ageing polish works to break down dead skin cells, whilst brown sea algae replenishes moisture to reveal a visibly smooth, supple complexion and healthy glow. A gentle, foaming cleanser formulated to eliminate debris and daily impurities, preparing skin for the application of further skincare products. Its rice amino acid complex is combined with hydrating ingredients to reveal a soft, smooth looking complexion and improved skin tone, without over-drying or uncomfortable tightness. Sodium PCA retains moisture to restore a healthy-looking glow. Deeply hydrating, the moisturisre helps skin retain moisture for a healthy, youthful glow. A unique biopeptide decreases the appearance of wrinkles and inspires smooth, supple looking skin. Expect nourished skin with renewed radiance. An ultra-rich eye cream infused with MDCP Complex and a blend of sheer light diffusers that work to visibly diminish the look of dark circles, fine lines and puffiness around the eyes. Fortified with expert technology, including caffeine-based agents, the targeted eye cream helps skin appear firmer and increases hydration by providing a moisture barrier. Skin around the eyes looks and feels firmer and younger with diminished dark circles. Fine lines and crow's feet appear to disappear, and eyes feel treated. Working to improve skin tone and texture, pure quartz exfoliating crystals and salicylic acid help eliminate dead, dull skin cells, whilst a blend of Kigelia fruit extract and marula oil rejuvenate and soften. Fortified with zeolite; a natural mineral that creates a pleasant warming sensation on contact with the body, the polish leaves skin feeling smooth, supple and fresh with a healthy-looking glow. Formulated with glycolic and salicylic acids to help improve skin tone and texture, the gel cleanser works to reduce the appearance of dark spots and discolourations for a radiant, younger-looking glow. Enriched with watermelon seed oil and Kigelia fruit extract, the foaming formula eliminates impurities and dull skin cells without over-drying or uncomfortable tightness, whilst keeping skin hydrated and maintaining moisture levels. Skin feels smoother, softer and purified. An innovative treatment powered by 10% glycolic acid to help improve skin texture, tone and discolourations, whilst minimising signs of ageing. Fortified with HYLAPLEX™, a hyaluronic acid-based compound that works to plump fine lines, the nourishing treatment is packed with African moisturising agents, including marula oil, kigelia fruit extract and shea butter to hydrate and maintain the skin's moisture level. Skin is softer, smoother and younger-looking. Polish: Once daily, apply a small amount to damp skin then gently massage over face, neck and décolleté, avoiding the eye area.Rinse thoroughly, then follow with The Method: Cleanse. Cleanse: Apply a small amount to damp skin then gently massage over face, neck and décolleté, avoiding the eye area. Rinse thoroughly then follow with The Method: Nourish. Nourish: Apply a small amount to damp skin twice daily after cleansing. Gently massage over face and décolleté, including the eye area. Eye Contour Lifting Cream: Apply Eye Contour Lifting Cream once or twice daily around the eye area. Gently gently pat down using the ring finger. Body Polish: Once daily, apply then gently massage a generous amount onto wet skin using firm, circular motions. Rinse off and follow with The Method: Body Cleanse. Body Cleanse: Once daily, squeeze onto hands and lather onto body, then rinse. Pat dry, then apply The Method: Body Nourish. Body Nourish: Massage a generous amount into skin after bathing or showering. Initially, use once daily. Application can be increased to twice daily, unless irritation occurs. Do not exceed two applications daily unless directed by a physician. Body Polish: PEG-8,Glycerin, Alumina, Sodium Bicarbonate, Butyrospermum Parkii (Shea) Butter, Oleth-20, Trihydroxystearin, Silica, Glyceryl Stearate, PEG-100 Stearate, Helianthus Annuus (Sunflower) See Oil, Kigelia Africana Fruit Extract, Sclerocarya Birrea Seed Oil, Salicylic Acid, Water (Aqua), Ascorbic Acid, Tocopheryl Acetate, Retinyl Palmitate, Butylene Glycol, Fragrance (Parfum). *subject to change. Body Cleanse: Water (Aqua), Sodium C14-C16 Olefin Sulfonate, Cocamidopropyl Betaine, Acrylates Crosspolymer-4, Sodium Lauroyl Methyl Isethionate, Propanediol, Citrullus Lanatus (Watermelon) Seed Oil, Kigelia Africana Fruit Extract, Sclerocarya Birrea Seed Oil, Sodium Methyl Cocoyl Taurate, Glycolic Acid, Glycerin, Salicylic Acid, Dextrin, Polydextrose, Disodium EDTA, Sodium Cocoyl Isethionate, Sodium Hydroxide, Amylopectin, Niacinamide, Butylene Glycol, Sodium Benzoate, Fragrance (Parfum). *subject to change. Body Nourish: Water (Aqua), Glycolic Acid, Caprylic/Capric, Triglyceride, Glycerin, Isopropyl Isostearate, Butyrospermum Parkii (Shea) Butter, Cyclopentasiloxane, Cetearyl Alcohol, Dimethicone, Dipentaerythrityl Hexa C5-9 Acid Esters, Pentylene Glycol, Stearic Acid, Glyceryl Stearate, PEG-100 Stearate, Hydroxyethyl Acrylate/Sodium Acryloyldimethyl Taurate Copolymer, Citrullus Lanatus (Watermelon) Seed Oil, Glycine Soja (Soybean) Extract, Yeast Amino Acids, Hexapeptide-48 HCl, Kigelia Africana Fruit Extract, Sclerocarya Birrea Seed Oil, Zanthoxylum Bungeanum Fruit Extract, Squalane, Sclerotium Gum, Ceteareth-20, Tocopheryl Acetate, Menthoxypropanediol, Sodium Hydroxide, Sodium Hyaluronate, Ascorbic Acid, Polysorbate 60, Disodium EDTA, Butylene Glycol, Ethylhexylglycerin, Hexylene Glycol, Caprylyl Glycol, Phenoxyethanol, Fragrance (Parfum). *subject to change.